The Royal Court's new play 'Hero' is billed as an intricate and provocative take on modern attitudes to sexuality. Samuel A. crown, who didn't agree, explains why he left during the interval. “There’s some stuff people don’t know how to say out loud. They don’t know how to make it normal.” So says Danny, an openly gay primary school teacher, towards the end of E V Crowe’s new play. 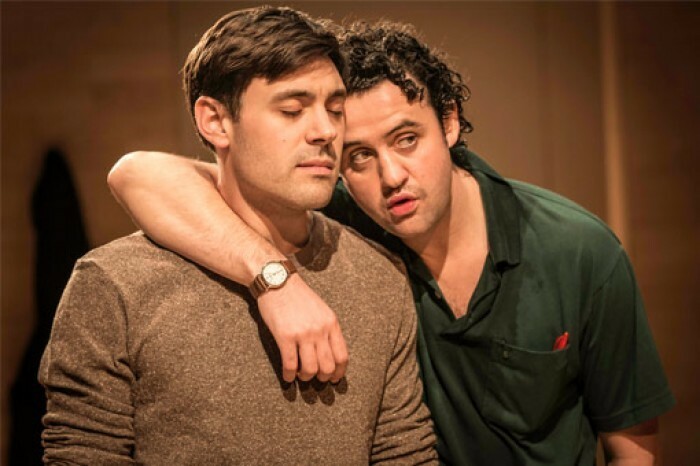 Unfortunately, in a play which seeks to tackle modern-day perceptions of continuing prejudices towards homosexuality, that accusation can very easily be levelled at the playwright himself. In the interests of full disclosure, I must admit to having left at the interval. However, my companion and I spent the first half of the show wondering whether to be merely disappointed or emphatically offended by Crowe’s well-intentioned but ultimately misguided attempts to present the domestic life of a gay couple living in present-day London. Though the production was certainly not without its merits, having since read the playscript in its entirety, I found nothing to ameliorate my initial concerns. Danny and Joe are a thirty-something gay couple living in London. They are seemingly happy, though apprehensive, as they begin the process for adopting a child. Jamie, Joe’s long-time friend and a fellow teacher at Danny’s school, is struggling to cope with the anxieties and pressures surrounding his wife’s IVF treatment. Against this claustrophobic background tempers are frayed; and when Jamie is the victim of homophobic abuse, knee-jerk finger-pointing reveals that he and (it is implied) society at large are not as liberally minded as the general consensus might have us believe. And so the stage is set for a somewhat heavy-handed debate about homosexuality in the twenty-first century, which ultimately lacks the subtlety of truth. And it is this lack of truth that riled me so much. In the words of Harold Pinter, ‘a play is not an essay”, and Crowe’s attempts to push an agenda on a rather liminal issue, to espouse rather than engage, results in characters that are impossible to relate to. They are foreign. Alien. Specimens to be viewed, considered and dissected. And therefore dehumanised. In a play that seeks to engage with gay rights that is a worrisome outcome. In Crowe’s world, gay couples are not like normal couples. They come home and debate the minutia of gay rights. They feel the need to scream “We are normal!”. They make wry observations that their friend “does have quite gay trousers on”. They speak in crass euphemisms (“There’s no way you’re going around telling all your kids you’re lord of the dance”). They are obsessed with their own sexuality and cannot view the world except through that lens. Sure, there was a time when something similar to this might have been the case: there comes a juncture in the emancipation of minorities when ghettoisation is necessary. In the plight toward self-identification a group can becomes exclusive and introspective. But that is a long way back from where I stand today. Of course, for all our progress, homophobia is still rife in society. Regardless of the inspirational campaigns and life-affirming Youtube videos, we still hear news of “gay suicides” (a rather simplistic notion) or violent murders motivated by the victim’s sexuality. And, as depicted in Hero, hate mail is still sent with repulsion and received with despair. Monsters really do exist. Well, as far as I’m concerned, we hold these truths to be self-evident. I feel no need to affirm them. In my world, I do not need to assert them. Worryingly, in Crowe’s world, I do. Samuel A. Crown is an actor based in London.